Consider a residual type of treatment that kills them, but you spray on surfaces to create a barrier around you and your home. 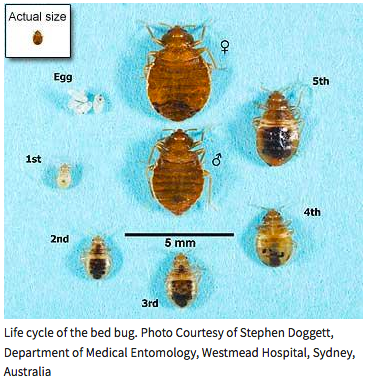 Important facts to remember when trying to identify a bed bug. 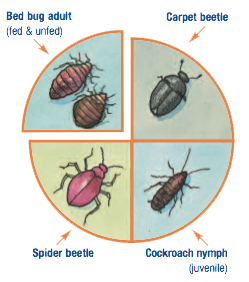 Each bed bug has the following traits whether it be a nymph or fully grown adult. Bed bugs can wreck havoc emotionally to there victims. Your not alone in this, yes it’s stressful but we offer assistance and complete procedures on how to get rid of bed bugs permanently. If you have any questions, comments or would like to post pictures of your pest. Feel free to do so in our comment section. Hi Joseph, thanks for sending us your question. Yes, bed bugs do take a toll on the family and are somewhat exhausting to deal with. No worries, as a customer your going to have access to a Green Bean Buddy specialist and our guides. I will briefly answer your question, then share some tips on treatment so you get rid of the bed bugs for good. For a four bedroom home, I would suggest to first do a heat treatment using the steamer. Then use the bed bug killer and residual formulation: (4) 1 Gallon Bed Bug Killers or a 5 Gallon pail. To ensure you get rid of them, you will want to make sure to inspect every nook and cranny in those bedrooms. Also, look in the box springs and even picture frames on the walls. Then once you get an idea of the spots, you want to treat the bed, boxspring, barrier around the beds, to protect yourself from the bites. Finally, consider spraying around the walls, as the bed bugs travel room to room. And lastly, don’t forget about the couches. You may need to treat there. I recommend a re-treatment every 3 to 5 days for the first month just to ensure your getting the ones that are coming out of hiding after the 1st treatment. Also, don’t drench, just spot treat so you budget the product for re-use when needed. Keep in mind, where they may be coming from. You will want to know the source so you can treat it correctly. 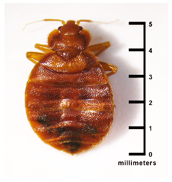 sometimes external sources like (backpacks, kids from school, clothing, public transportation, neighbors, etc are likely candidates for catching bed bugs). Hi Ashley, totally understand your position. We believe that our product is the only investment you will need to make in order to get rid of these bed bugs. We find a lot of customers come to us after trying so many different products on the market. What’s important regardless what you choose to use. Is to stay consistent with the treatment. Don’t give up and remember these pests can re-infest from external sources so you will want to create a barrier around your home to protect yourself from these pests. If they are in the bedrooms, then you will want to treat the bed, boxspring, picture frames, and spray a barrier around your bed before sleeping. This will help in killing the bed bug but also prevent re-infestations. Be sure to go over these guides, and understand all the locations the bed bugs can hide. Then simply treat these areas consistently until the infestation is gone entirely. Depending on the size of infestation this may not be gone over night, so don’t get discouraged. Just continue consecutive treatments. Another thing is… don’t drench when using our residual bed bug spray. Simply spot treat this will give you more product to use. The product has a residual which will is active and kills bed bugs for up to 30 days, sometimes longer as we had found in our 12 month case study. If you feel comfortable, let us know your budget you have available and the size of your infestation. We will do our best to steer you in the right direction. We wish to truly help our customers the best we can. Everyone has a budget! We understand that. So do we 😉 We will do our best to help. Hi Angie, alcohol has the ability kill the bed bugs, but it’s not a recommended treatment method. Below is why. + HIGHLY FLAMMABLE: There are people burning down their homes using alcohol, even one person recently died in the car using it. + NO RESIDUAL: You will be constantly buying alcohol and with each treatment running the risk of burning down the house. Sure you could use it, but we hear people continue telling us they been trying alcohol for months and no luck. The reason is because it has no residual… and you will endlessly need to treat your each and every bed bug. It’s the only way it kills them. You may wish to read more about residual bed bug treatment, so you can understand the difference between a contact killer vs a residual bed bug treatment. 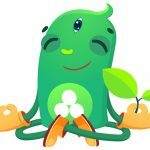 Thanks for sending in your question, it will help others in the Green Bean Buddy community.